Sylvia Brower took first overall in Steamboat Springs 3km classic race. STEAMBOAT SPRINGS — The East Grand Middle School girls Nordic ski team took second place in the three-kilometer classic race in Steamboat Springs Saturday, helped by strong skiing by Sylvia Brower and Annie Kuhns. The boys team took third place, helped along by strong skiing by Gray Barker and Nick Forquer. 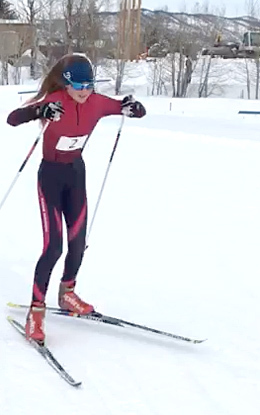 Eighth grader Sylvia Brower took first place overall in the girls race, skiing the course in 10:03.9. Gray Barker was the top Cubs skier for the boys, finishing in fifth place with a time of 9:33.9, followed closely with a sixth place finish by Nick Forquer (9:47.4). Skiers for the Cubs included, for the girls: Annie Kuhns, seventh; Anna Lantermans, 11th; Gabriella Pellini, 16th. Other skiers who finished for the boys were: Andy Troccoli, 13th, Dane Jensen, 21st, Calvin Ciccarelli, 22nd; Carter Chamberlin, 28th; David Hammond, 32nd; TJ Tibbetts, 33rd; Kadin Starr, 36th; Logan Walker, 40th.